Many thanks to everyone who came to the Book Cellar on Thursday, I had a damn good time. And well done, thank you for tearing through their stock of The Slide. I’ve been assured more copies are on the way. The February issue of St. Louis Magazine comes through with this nice little artilce featuring a great Mark Gilliland photograph taken in the new version of our beloved rocket slide. 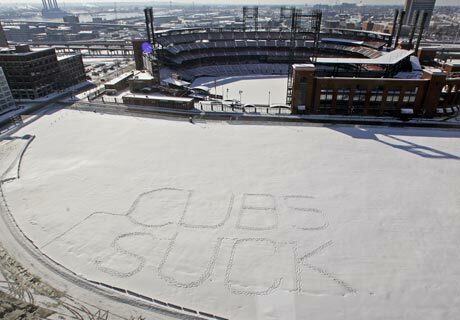 Looking forward to St. Louis this week. See you at Left Bank Books on Thursday night? Hell yes. Great. Great. This morning I awoke to an email from Chris Bower, who has now posted his “Confederacy of Dunces: An Open Letter to Storytellers” to his website. It is worth reading, absolutely, especially if you live in Chicago or another city where people tell stories, or if you just happen to be a human being. Some of us may have grown up in the country or in a suburb of a city. Some of us grew up in the middle of a city. Some of us grew up in the country surrounded with violence and despair. Some of us grew up in the city being kissed by mayors and having our social security numbers stolen to start up gas service. Some of us grew up in Suburbia feeling nothing could ever ever ever ever ever hurt us and some of us grew up in Suburbia wondering if certain foods were fruits, vegetables or God forbid, legumes. Also I want to include the following link to the artwork of David Metcalf, which I’ve long, long admired. God bless Louisville, KY. Thank you everyone else. Pretty fine Slate article today by James McWilliams about the potential benefits of genetically modified organisms, if only folks could look beyond their increasingly ridiculous fear of proven-safe technologies that aim to feed the poor and slow the rich’s destruction of our planet. The Day Itself. Today. Goodness. Do you still have a job? I hope you do. Tough times, these. Tough enough to drive men and women to the bottle, pills, or even, to read. To read a book. 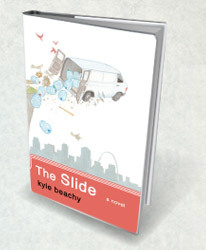 Today, I am outrageously pleased to say that my debut novel, The Slide, has arrived in stores across the country and on the internet. I invite you to take a moment to check out the reviews I’ve collected on the site, click the links, watch the trailer, take as much time as you need. And do you know how affordable the book is? With a $13 sticker price, about the cost of a movie in Manhattan, or an exotic foot massage outside of Columbia, MO. Priced for the global economic downturn. And do you know what else? Thank you for coming. If you’ve already bought a copy, thank you for your support. Even if you haven’t bought the book, will never buy the book, thank you too. Today I thank everyone.